A party look with a pop of hot pink! I am so in love with this new skirt! The color combo of olive green with hot pink is just stunning. I paired it with an all black look so that the skirt really popped! The fullness of the skirt makes it a flattering fit. This black fur vest is another great addition to my closet. It really adds a little something extra to an outfit. The vest is currently 50% off making it only $62.50. It's a shorter length than my other favorite fur vest, but I'm really liking that with certain looks. **Always eat a little something healthy at home before a party, like an apple. Never go starving or you'll end up eating anything in sight. And don't stand next to the food table, you'll nibble without even thinking about it. **If you're taking a dish to a party, take something healthy, like a veggie tray, that you know you can fill up on then indulge in a little treat or two. **You can still have treats at a party, but take small pieces and choose wisely. Don't waste your treat on something you don't really like. I'm not going for the everyday chocolate chip cookie, I'm going for the decadent dessert that I don't normally eat. **If you want to drink alcohol, choose wine or light beer. And drink water instead of sugar-loaded punches. **Everything in moderation. One night of treats at a party isn't going to ruin your hard work. Just get back on your healthy eating routine the next day. Holiday time with friends and family is supposed to be enjoyable. So don't stress about it. This weeks feature blogger is Lindsay from Sell Eat Love. 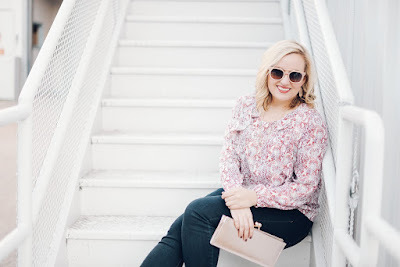 We love how girly, flirty and fun she looks in this pink silk blouse. Lindsay is an apparel sales rep. Her blog focuses on her travels with her job and all the fabulous fashion, food and cities she encounters. Great tips for partying in moderation! Your skirt is gorgeous! Love the colors and the vest! Thanks! I'm in love with the olive green and pink combo!! Loving this holiday outfit! Totally glam, but it looks like it's warm too! Perfection in my eyes! Thanks, such sweet comments! I think the fur vest really warms the outfit up. I absolutely love everything about this outfit!! The vest, the shoes, the tights.. all of it! That skirt is absolutely darling, I love the color combo too:)!! Thanks Emily! Glad you stopped by the blog! Perfect party style - Happy Holidays!!! Thanks! I love a good Holiday Party!!! Such a pretty skirt and love the vest too! Thanks! I love the pattern in the skirt and the fit of it! I love the flare of this skirt. And the colors are fantastic!! Glad you stopped by! Happy Holidays. Great tips - it's so easy to overindulge this time of the year. I love this look, the jacket is everything. Thank you for hosting and hope you are having a fab week! Thanks for your link up too. Thanks Jaymie!! The skirt colors are gorgeous! Thanks Maggie! I love the skirt too. The pattern comes in other pieces as well. Awesome skirt!! Love how your styled it! Thanks Elise, thats sweet of you to say. I love the all black! Such a pretty skirt and holiday outfit! 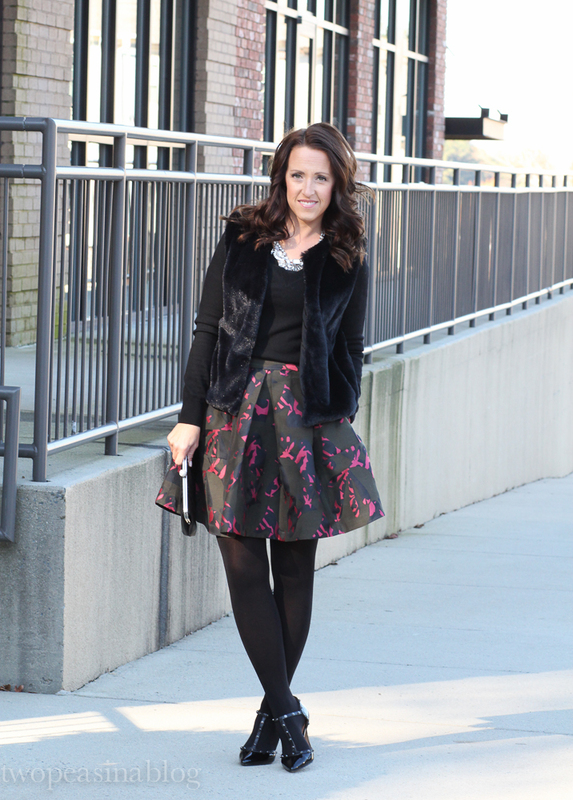 Such a pretty skirt, and loving it paired with the fur vest! Also loving these tips! Pretty skirt, looks perfect with the fur! What a great skirt! So fun. I love your vest too! Thanks! I love the skirt with the all black. This skirt is so pretty! I love how it pops against the all black outfit. Love that necklace! Thanks. The hot pink and olive green pair so lovely together. Such a pretty outfit, love the skirt. Great tips, I have been trying to bring healthy snacks with me when I can. Thanks Rachel. It's so easy to fall into bad habits this time of year. Good for you taking healthy snacks on the go. I love this holiday look!! That skirt is so beautiful and it looks perfect with your black faux fur jacket. Love! Thanks for stopping by Christie. The black fur is a fun addition to my closet. Kiki, thanks for joining our link up. Your sweet for saying such nice things. that skirt is amazing. I want it in every possible color! Abril, yes it's such a pretty pattern. A gorgeous skirt is definitely the best alternative to a holiday dress! Such a pleasure catching up with you two fashionistas. <3 Ada.